May I present to you: the perfect hangry meal! A legitimate, breakfast-for-dinner meal in less than 10 minutes. Such a beautiful thing to behold. It’s not gigantic but certainly filling enough for your hangry needs (thank you, butter). In my case, the feed-me urgency was related to a later-than-usual dinnertime caused by a yoga class. I’m sure you don’t need to be told how to make scrambled eggs, but I’ll tell you anyways! Crack your little eggies into a bowl, add salt, pepper, turmeric, and your milk and whisk with a fork until nice and scrambled. Heat a skillet on medium-low until warm and add your butter. Once the butter is melted and coats the pan, add your eggs. Grab your handful of broccoli and toss it in with your eggs. Cook a couple minutes, scrambling with a spatula however you like until your eggs are to your doneness liking. I like ’em with a bit of beautiful browning here and there. Yum. 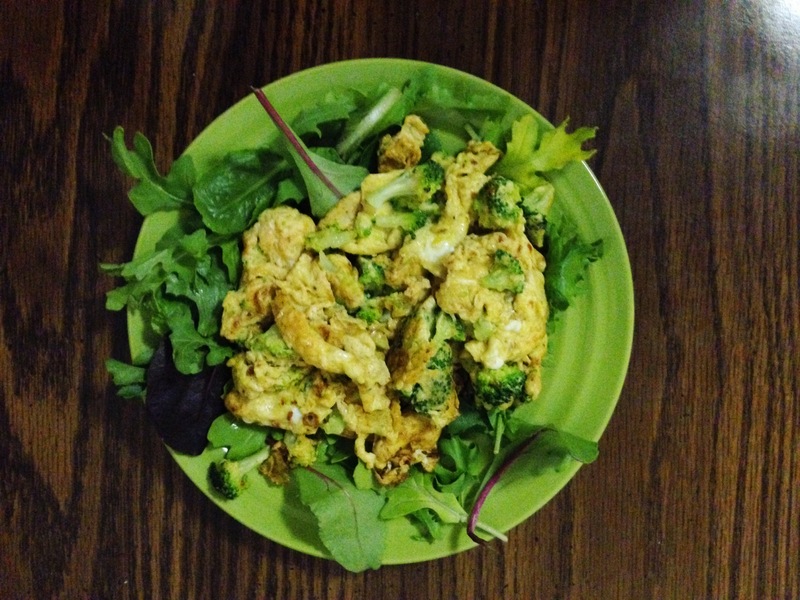 Put your greens on your plate, scoop the eggs on top, and eat! Garnish with whatever you desire. Cheese, for example, would be awesome. Cheese makes everything awesome. Happy hump day. Until next time, friends. Hugs! Categories: Breakfast, Dinner | Tags: breakfast, breakfast for dinner, broccoli, dinner, eggs, scrambled eggs, turmeric | Permalink.